Six games up and six games to go. As we have reached the halfway point in the 2013 BYU season it’s time to review the season up to this point. Starting the season with games against #15 Texas, Georgia Tech, Utah, and Utah State, a 4-2 record would seem to have been a very favorable expectation and that’s exactly where the Cougars are. The 40-21 victory over Texas was certainly the most unlikely victory, while the loss to Virginia was the most unlikely loss. Losing to Utah, while it has become the norm, was the most heartbreaking. By the time BYU plays the Utes again it will have been 7 years since we last beat them, which just too much of my life spent without a victory over the Utes. Sigh. Shrug. Tear. Sigh again. All in all I think a 4-2 start met my expectations and sets BYU up for a strong season, especially given Coach Mendenhall’s propensity to start slow and finish strong. While the defense hasn’t matched the historic statistical performance of the 2012 season, BYU’s strength has once again come on the defensive side of the ball in 2013. Despite the defense still doing its fair share of scoring (1 safety, 2 INT for TD) the offense is finally doing its fair share of putting points on the board. Senior LB Kyle Van Noy continues to be absolutely ridiculous causing havoc in the opponent’s backfield. A safety against MTSU and a pick six over Lord Chuckie Keeton on the first play against USU were just a few of the highlights that garnered him SI.com midseason All-American honors this week. The most amazing part of the BYU defense thus far is how well they have played despite losing Ziggy Ansah to graduation, Spencer Hadley to suspension, and a small army of other players to injury. Anchoring the linebacking crew with Van Noy has been Uani ‘Unga, who leads the team with 56 total tackles, Alani Fua, who terrorized Texas QB David Ash and returned an interception for a TD against Georgia Tech, and Austen Jorgensen, who is third on the team in total tackles with 37. On the defensive line, Remington Peck, Bronson Kaufusi, and Eathyn Manumalenuna have been solid against the run and been part of a strong pass rush that has allowed BYU to allow just under 200 yards per game. Just as impressive part of that pass defense equation, though, is the ability of some unknown DB’s who have stepped in and done a terrific job in pass defense. After key injuries in fall camp to Jordan Johnson, Trenton Trammell, and Sam Lee, the secondary appeared to be the biggest question mark and possible weak spot for BYU. The fact that you haven’t read a single report or seen a single story about the BYU secondary getting blasted really speaks to how they’ve gone about their business. Ok, now that you’ve calmed down from thinking that Taysom Hill will never complete a pass in his life and that he should be converted to a running back, let’s take a step back and assess the offensive performance as a whole. The Virginia & Texas games should really be thrown out as statistical anomalies when assessing how the offense is doing. 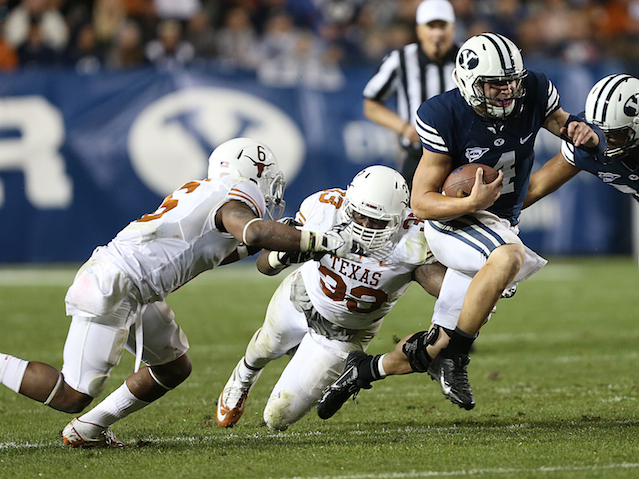 I mean, would you ever have predicted a BYU team would rush for 550 yards in a game, much less against Texas? You’ve been buying too much of Walter White’s famous glass if you answered yes. The offense is neither as overall incompetent as it seemed against Virginia nor as capable at running the ball as they were against Texas. The last three games against MTSU, Utah State, and Georgia Tech are probably more indicative of where BYU is at at the midway point of the season. Taysom Hill is starting to look comfortable throwing the ball, which is a good thing. That can be credited to having some real game experience with his receivers and offensive line to get the timing he and his receivers need to be effective, as well as the protection he needs to properly read the defense and make the right throws. As much fun as it is to watch him pummel the Longhorns for 259 yards and 3 TDs, I gotta say that the long-term Taysom is going to be the one that just runs the ball 8-10 times a game and puts 50-60 yards up. You don’t win many games going 9-26 passing for 129 yards like he did against Texas. But a Hill that can throw the ball effectively and not only keep you honest, but make some big plays with his legs, is dangerous and is truly a dual threat. His passing has improved significantly over the past three games (50-78, 699 yards, 4 TDs, 2 INTs) which has correlated with three comfortable victories over that span. The running game has been extremely effective this season. Even with lower rushing yardage the past few games from Hill, BYU still boasts the #13 rushing offense in the nation, averaging 263 yards per game on the ground. Jamaal Williams was eerily injured in the Utah game, but bounced back to play against Utah State and is having a solid sophomore campaign. While he hasn’t been getting into the endzone at the same clip he did last year, he is averaging nearly 110 rushing yards per game. With Michael Alisa again being injured and out for the season, look for Williams to top the 1,000 yard rushing mark and add some TDs to his statline. The Cougars have yet to have a real “go to” wide receiver emerge this year. Cody Hoffman has missed two games due to injury and suspension and has accounted for just 311 yards on 18 receptions and one SPECTACULAR touchdown grab. Against Utah State Mitch Matthews had a breakout game with 112 yards and 3 TD catches, but has only accounted for 141 yards in the other five combined games. JD Falslev has had a quiet first half with 15 catches for 185 yards and a TD, though that TD came in the season opener. As Hill gets more comfortable throwing the ball look for Matthews and Hoffman to have big second halves and be big contributors in the Cougar receiving corp. I wish I had a snarky joke to insert here about BYU’s special teams. With the pathetic placekicking of the past few seasons it has just been too easy. Can’t do that this year, though, as Justin Sorensen has been kicking the ball extremely well. He has converted 9 of 11 field goals on the year and is 20 for 20 on extra point kicks. The leg strength he was recruited for and showed as a freshman hasn’t quite been there, though, as he has converted touchbacks on just over half of his kickoffs this year. Punter Scott Arellano has kicked very well and reliably, averaging better than 41 yards per punt on the season. Only knock on the JUCO transfer is that his painfully slow punting motion has resulted in three blocked kicks. One of the most impressive and exciting trends from the first half has been the kick return abilities of Adam Hine. That kid is just straight up explosive and it keeps me up at night thinking of how we might use his open field abilities for the next two and a half seasons. If it weren’t for stupid blocking penalties occurring behind the play, Hine would have two TD’s on kick returns thus far. As is, he is averaging nearly 33 yards per return including a long of 90 on the year. There’s just a tingle I get in my spine when he touches the ball that he’s about to do something special, something that makes me grateful for a DVR and the beautiful picture on ESPNHD. 1) Don’t expect too much from the offense. The offense is improving week by week and I fully see that trend continuing. Part of the anguish from the early season struggles for fans came from an unreasonable expectation that “Go Fast, Go Hard” was going to look like the Oregon Ducks. Wrong. BYU will never do it quite like Oregon, but that’s ok! 2) Expect a close, tough loss on the road in the midwest. BYU is going to beat Notre Dame or Wisconsin, but probably not both. Couldn’t tell you which one they’ll win, though. There’s a part of me that says losing to Notre Dame three straight games is just enough and we are due for a win. Then again Notre Dame may just have BYU’s number the way Utah does. Wisconsin will be tough not just because Wisconsin is a quality Big 10 opponent, but because Gary Andersen’s other tattoo may as well read “BURN IN HELL, BYU!” Mendenhall has schemed well against Andersen, so it’s too tough to call on that game. 3) In addition to the aforementioned loss in the midwest, I see BYU faltering to Boise State or Nevada. Boise State seems beatable this year and playing the game in Provo should give BYU the edge, but you just can’t ever predict anything well against those Chris Petersen and his Smurfs. Nevada should also be a winnable game, but BYU has lost to them before and the trip to Reno could prove tougher than predicted. BYU will finish the year 8-4, possibly 9-3. Good, detailed assessment of the season. Hopefully your prediction skills are bad though–I would like to beat Nevada AND Boise State! But I would trade any of our other wins for one against Utah. I hope the offense does continue to improve each week, we will see a huge deference by the end of the season.